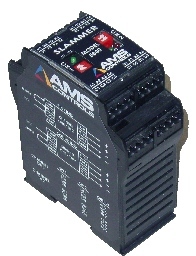 The “Slammer” solenoid driver module (5840) enhances the consistency and speed of activating valves and solenoids. It can repeatedly fire a valve more frequently than what can normally be achieved with a normal I/O supply. The module “slams” the solenoid valve with a short pulse of: 45VDC or 60VDC or 75VDC or 90VDC. It quickly drops to 24VDC for the duration of the output signal. The high-voltage pulse makes the solenoid react faster and more consistently, while the quick drop in voltage saves the solenoid from excessive current, preventing damage to the valve. The Slammer is especially useful in open loop flying die applications, where reducing the time between the shear output activating and the shear contacting the material can increase the efficiency of the shear’s reaction time, creating a more accurate cut.